Posted by Madeline Patton on July 29th, 2013 at 11:00am . 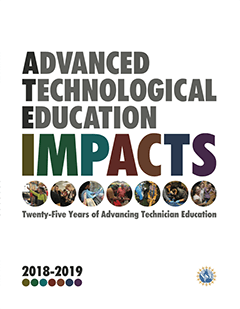 The SC ATE National Resource Center for Expanding Excellence in Technician Education launched a searchable Compendium of Research on Technician Education in mid-July. The compendium is the first phase of a Proven and Promising Practices database at www.TeachingTechnicians.org (menu choice, lower right-hand corner of Homepage). The compendium currently contains 332 entries of published research on technician education and related topics of interest to the Advanced Technological Education (ATE) community, its stakeholders, and other educators. Relevant content from peer-reviewed scholarly journals and other sources will be added as they come to the team’s attention. Posted by Madeline Patton on July 22nd, 2013 at 11:00am . This month, Annette Parker began her duties as the new president of South Central College, a Minnesota State Community and Technical College (MnSCU) with campuses in Mankato and Faribault. The college emphasizes globalization and has partnerships with regional businesses and industries to offer students internships and employment. As principal investigator and executive director of the Automotive Manufacturing Technical Education Collaborative (AMTEC) from 2007 until May, Parker brought competing automakers together with the United Autoworkers in collaborative relationships with community colleges in 12 states for the center that is part of the National Science Foundation's Advanced Technological Education program. AMTEC and its partners have developed a modularized, hybrid online lecture and in-person lab curriculum designed to teach both students and incumbent workers the technical skills and critical-thinking skills required to succeed as a maintenance technician in advanced manufacturing. The AMTEC partnership and the products it has developed have placed the AMTEC partner colleges at the forefront of mechatronics education. Posted by Madeline Patton on July 15th, 2013 at 11:00am . Partnerships built to meet Advanced Technological Education grant requirements have helped Austin Community College's biotechnology teacher education program continue long after National Science Foundation funding for it ended. "I took very seriously the part of the grant application that said it had to be sustainable because I didn't want it to go away," said Linnea Fletcher, principal investigator of the ATE grant and chair of the Biotechnology Department at Austin Community College. Posted by Madeline Patton on July 8th, 2013 at 11:00am . Thirteen years after Austin Community College's Biotechnology Department used an ATE grant to adapt its introductory biotechnology course as professional development for high school teachers, the course is firmly embedded in Texas' curriculum for students as well as teachers. Austin Community College's (ACC) Introduction to Biotechnology was adopted four years ago as the standard curriculum for Texas high schools to use for a year-long elective that counts toward the state's four-year science requirement for graduation. More recently the Texas Education Agency (TEA) awarded ACC's Biotechnology Department a grant to develop an online biotechnology certification program for high school teachers. Linnea Fletcher, chair of the Biotechnology Department at Austin Community College, used the grant to hire four biotechnology teachers who participated years ago in her ATE-supported faculty development program to create the podcasts, videos, and iBook for the online certification program. Fletcher is thrilled that the professional development initiative started with ATE support has been sustained in ways that she did not anticipate in 2000. "It's reaching a second generation of teachers," she pointed out. Posted by Madeline Patton on July 1st, 2013 at 11:00am . Shaun Vester transitioned immediately from intern to full-time geographic information systems (GIS) analyst in a regional planning office this spring. The internship was part of the 15-credit Geospatial Certificate Program that Lake Land College Geography and GIS Instructor Michael Rudibaugh developed with support from the National Science Foundation's Advanced Technological Education program. The 25-year-old Vester is glad that the certificate program is making it possible for him to earn more money. Posted by Madeline Patton on June 24th, 2013 at 11:00am . Florida engineering technology students who studied in Spain with support from the National Science Foundation gained new perspectives on energy systems and conservation efforts through their classroom lessons and cultural experiences. "Over there, everywhere we went they made sure we turned the lights off," said Danielly Orozco-Cole, Curriculum Coordinator of the Florida Advanced Technological Education Center for Excellence (FLATE). Walking long distances and taking public transportation— the most common modes of transportation in Spain—showed the students that energy conservation is a way of life in Europe. Posted by Madeline Patton on June 17th, 2013 at 11:00am . When the long-time principal investigators (PIs) of Advanced Technological Centers consider the span of their involvement in the National Science Foundation's innovative technological education program, the technologies they used in their early ATE days provide interesting gauges of progress. The Advanced Technology Environmental and Energy Center was one of three centers funded in the first round of grants awarded in the summer of 1994. The center was then known as the Advanced Technology Environmental Education Center. ATEEC has consistently served as its acronym even as the mission has evolved. For the first year and half of ATEEC's existence, the staff relied on telephone calls and letters delivered by the U.S. Postal Service to communicate with NSF personnel, its industry partners, and the educators it was trying to reach with its hazardous materials training and related curriculum. The internet was up and running at that time, but not in the Eastern Iowa Community College District. "We grew up literally, and NSF pushed us as an institution to be more technologically advanced. They were used to dealing with four-year [institutions]," ATEEC PI Ellen Kabat Lensch recalls. Getting a website was even a bigger deal than email. The center was located at Scott Community College in Bettendorf, Iowa, and had to contract with an outside server because its plan for online activities exceeded the capacity of the college's computer system. Posted by Madeline Patton on June 10th, 2013 at 11:00am . Jill Zande never has a problem finding officials for the Marine Advanced Technology Education (MATE) Center's competitions for remotely operated vehicles (ROVs). For MATE's 12th Annual International ROV Competition on June 20 to 22 in Seattle, she has lots of volunteers from the Marine Technology Society (MTS) and dozens of corporate sponsors. Zande is the MATE Center's co-principal investigator, associate director, and competition coordinator. "Our member response has been nothing short of outstanding. In fact the only complaint I have ever heard is when some of our members, or member companies, have been jealous because they thought their rivals or competitors were more visible than they at competitions," said MTS President Drew Michel. Marine technology professionals have many opportunities to interact with students during a Career Expo, poster session, and engineering evaluations of students' ROVs. Employers also get the chance to see how 500 secondary school and college students perform under stress, as their robots perform tasks that mimic undersea workplace challenges. Posted by Madeline Patton on May 31st, 2013 at 12:02pm . Welcome to the ATE@20 blog. Our blog celebrates the 20 years of innovations and other accomplishments that the Advanced Technological Education (ATE) program has generated at community colleges, secondary schools, and universities around the nation. We have several ambitions for the blog. By telling ATE's success stories we hope to inform educators, students, parents, and industry partners about the ATE program and expand the ATE community's robust partnerships. The blog is available for ATE centers and projects to use on their websites and in their newsletters. By utilizing the blog's interactivity, ATE Central hopes to gather information for the ATE@20 book it is publishing this fall. We hope this interactivity enhances the collaborations that have been a hallmark of the ATE program since it began. The launch of ATE@20 comes 20 years after NSF began planning the Advanced Technological Education program. ATE itself was an innovation for the National Science Foundation, though one Congress asked NSF to create rather than one NSF sought. This first blog entry provides a brief summary of the ATE program's early history. The backstory focuses on the involvement of Gerhard Salinger and Elizabeth Teles in shaping the program that has become the National Science Foundation's largest investment in community colleges. Congress passed the Scientific and Advanced Technology Act known by its acronym, SATA in October 1992. President George H.W. Bush signed the legislation on October 23, making it Public Law 102-476. Its sponsors included North Carolina Congressman David Price and Maryland Senator Barbara A. Mikulski. Price, a Duke University political science professor before his election to Congress, wanted the NSF to support workforce issues in a way that complemented Department of Education tech-prep activities and Department of Labor short-term training. Mikulski, a social worker before she began her political career on Baltimore's City Council, wanted government investments in high tech fields to include economic development for diverse populations. The American Association of Community Colleges (AACC), then known as the American Association of Community and Junior Colleges, had lobbied Congress for years to get NSF to pay more attention to community colleges. Then, as now, community colleges educated nearly half of the nation's undergraduates. AACC had involved professional societies in its effort to obtain federal help to improve math and science programs at two-year colleges. Meetings of experts were convened and reports issued. Perhaps the most important of the various meetings on the subject was the Workshop on Science, Engineering and Mathematics Education that NSF convened May 13 and 14, 1991. The report from this workshop, Matching Actions and Challenges, influenced several people who later shaped the ATE program.